Ah well that Doctorow and his posse of INTELLIGENCE MONGERERS. Needless to say, I'm intrigued about the proposal for an atheist christian congregation. I smell a hoax...? 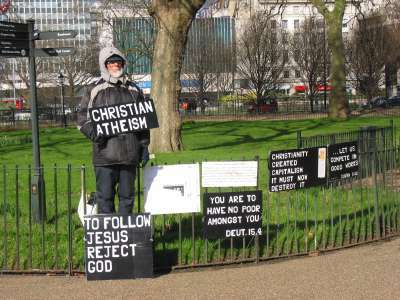 I love a wacky protest....bring on aetheist christians next! 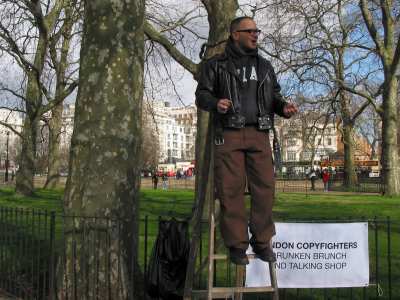 Does the sign in the last photo say "London Copyfighters - (D)runken Brunch and Talking Shop"? What's that supposed to mean? It does. It's an informal gathering of people interested in issues of copyright, open access to information and such. 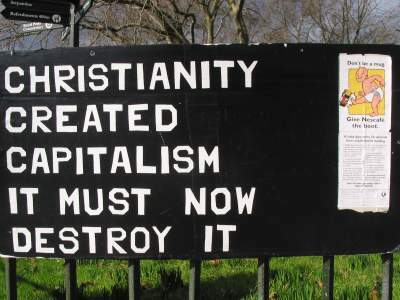 I thought that sign said CHRISTIANITY CREATED CAPITALISM, IT MUST NOT DESTROY IT, which would have been more interesting.